Whilst not part of the 'historical' core of the BHGS - the ever popular Epic Armageddon is another intriguing part of the tabletop gaming community as is welcomed at Britcon! All tournaments and competitions need rules and restrictions. Epic-UK tournament rules are a set of guidelines for individuals to use at their own events should they so wish. Epic-UK is an independent EPIC Armageddon tournament provider within the UK. Epic-UK’s sole purpose is to improve and enhance EPIC Armageddon tournament wargaming throughout the United Kingdom; therefore the main focus of this rules pack is that all players attending an Epic-UK event should enjoy every game they play over the course of the event. The rules used will be Epic Armageddon First Edition. You may only use army lists located in /on the Epic-UK website. There is a four-week grace period before an Epic-UK event. If GW/Epic-UK formally releases a new Army list or rules modification within four weeks of an Epic-UK event, then this list or rules modification will not be used. If released more than four weeks before the event, then this list or rules modification will be used. This includes all material published via GW whether via printed media or via the internet. Read your rulebooks, supplements and other relevant material to refresh your memory before attending the event. Remember you may play against players who do not interpret the rules in the same way as you do, so be prepared to compromise and accept the fact that you could be playing the rule incorrectly. Don’t forget that you need to bring all the relevant materials to play. Specifically dice, tape measures, templates, rulebooks, supplements, and any other materials you require to play a game of Epic Armageddon. The Epic-UK Rules Clarifications will be used. These are available in Appendix 1 of this rule set. You should ensure you have at least two legible copies of any required documents as specified in the event specific rule set (e.g. army roster). One copy is for judging and the others are for your use during the event. If you do not bring these you will incur a penalty score. Due to a number of instances of inaccurate or illegal army lists being submitted, we require that all army lists are submitted prior to the event in order for them to be checked over thoroughly. Army lists must be submitted prior to the event via email to the address given in the event specific rule set. In all instances, you will receive emailed confirmation of the legality (or any faults) of your list. Penalties for late submission of lists are detailed in the event specific rule set. Lists must be submitted in either .doc, .txt, .xls or html/htm formats only. If you send an army builder text file, please take the time to format it legibly, or else you will receive a penalty for an illegible list. Army Builder files will not be accepted and you will be asked to re-submit. The organiser may advise you to change the composition of your army to allow for a more fulfilling gaming experience for all gamers involved at the tournament. Where at all possible all models in the army should be WYSIWYG - what you see is what you get. 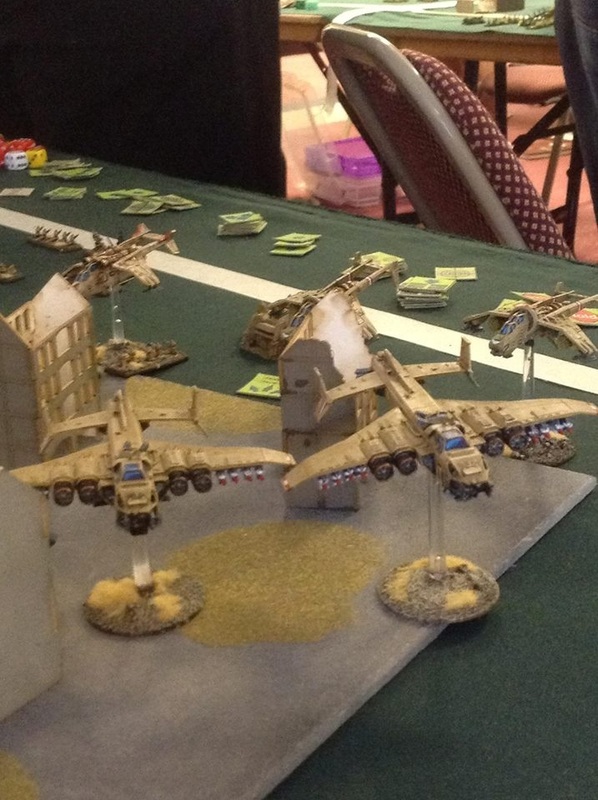 At the umpires discretion non-WYSIWYG models may be removed from a players army – the player will be required to continue with his army “as is” for the remainder of the tournament. Armies must be fully painted and based. Note that you do not have to base tanks, although many players prefer to. 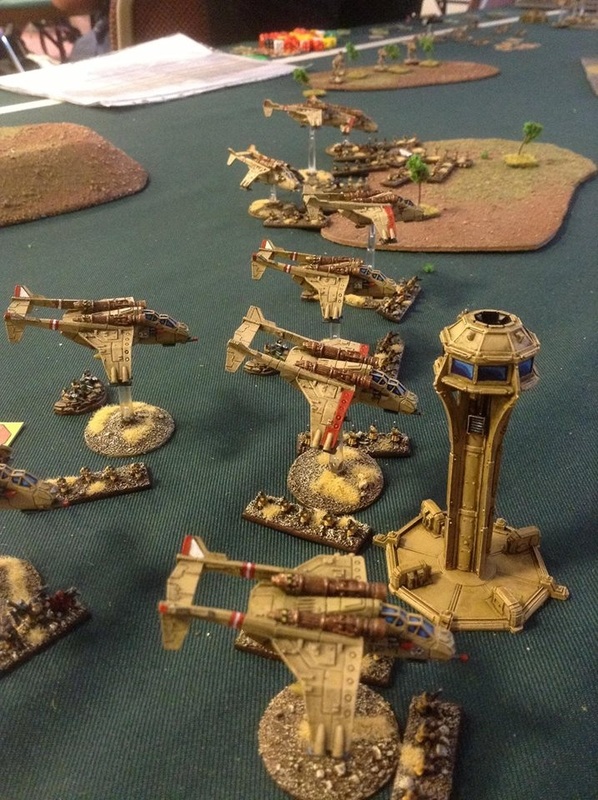 Ensure you are using the correct miniatures to represent your units as far as you can. Using non-Citadel miniatures is acceptable providing they fit into the Epic Universe and you can tell what they are supposed to be. If the miniature does not look appropriate, then it may not be used. Basically if it doesn’t look like what it is meant to be, then don’t bring it! Players must provide a copy of the rules for their army i.e. Army List. You must use the same list for all your games. Players are encouraged to use standard base sizes for troops (20mm square or 40mm x 10 mm), mainly because it leads to less ill feeling from other players. Tables will be approximately 120 cm by 180cm. Terrain will be preset on the tables. However please bring as much terrain with you as possible to help us out. The tournament scenario as detailed in section 6.1 of the Epic Armageddon rulebook will be used and all rules for that scenario will apply. The first game will be determined randomly in advance unless grudge games are allowed. Refer to the event specific rule set to see if grudge games are allowed. The final rounds will be based on the Swiss system, in order to find a fitting winner. Before battle commences there will be a five-minute 'warm-up' period. Tabletop miniature wargaming is not an exact science. One person's line of sight is another's blocked fire arc and so on. Due to this you should spend five minutes going through things like how the line of sight rules will work, how the terrain features used will work and so on. Lines of Sight and Lines of Fire. Terrain features - what do they count as on the terrain chart, when are units 'in' terrain. Note we are assuming that players will use some common sense here! All games will last the number of turns noted in the scenario description or a pre-determined time. Note this time includes terrain placement (if applicable at the event), discussing each other’s army lists and any special rules, discussing the effects of terrain and troop deployment. Players playing particularly slowly or deliberately time wasting may receive a penalty score deduction. Remember there is a sequence of play (and a chart is provided in the rulebook). Should you forget to do something - tough, it is your fault. Do not use the “puppy dog eyes” tactic and try to make your opponent feel guilty, this is unfair. Accept your mistake and get on with the game.